In 1909, our founding director, Fritz Wichert, consciously positioned the Kunsthalle Mannheim as a space for encounter. He created a modern “art museum for all” – regardless of age or background. We are still following this motto today. We seek to appeal to all of you: families, children, and young people, professionals, senior citizens, and tourists – experts and lay people, art enthusiasts and art skeptics. So it makes sense that the themes of our guided tours, debates, lectures, workshops, art discussions, and film evenings are similarly wide-ranging. In lively exchanges between visitors and curators, artists, and leading experts in art and beyond, the Kunsthalle remains a place for open conversation and cultural recreation, remaining loyal to Wichert’s founding vision. What was the artist thinking when creating this work? Why did the curator decide to display it in this way? The art educators at the Kunsthalle Mannheim provide answers to these questions and many more. A trainee joined their ranks on July 1, 2017, a move made possible by the Federal Foundation for Culture’s “lab bode – Initiative for the Strengthening of Educational Work in Museums.” The aim of this traineeship is to come up with innovative ideas for education and to experiment with the program on offer, focusing especially on the activities aimed at young people. 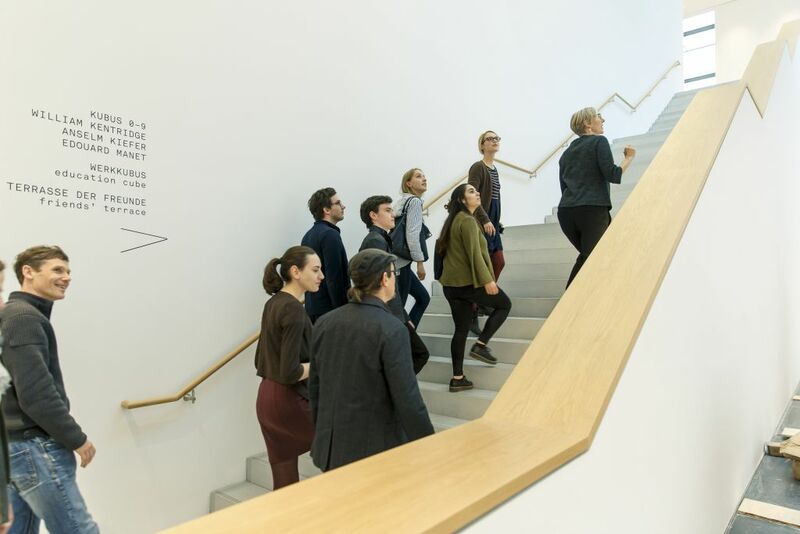 The purpose of the nationwide initiative – to initiate programmatic processes for change within museums – aligns perfectly with the new Kunsthalle Mannheim, which as a city within a city creates a unique place for encounters between people and art. The Kunsthalle Mannheim has begun its collaboration with the Mannheim Abendakademie. From June 1 onward, you can book all tours and workshops for schools, children, young people, and families directly through the Mannheim Abendakademie. We are happy to arrange individual tours in English or French by appointment. We can be reached by telephone or via email for planning or for further information. The number of participants is limited to 25 people per group. The (accessible) visitors’ entrance for groups is located on Tattersallstraße. The Kunsthalle Mannheim permits self-guided tours for adult groups following registration and booking in advance. The number of participants is limited to 25 people per group. Several self-guided tours running in parallel can also be arranged. At the Kunsthalle, anniversaries, Christmas parties, or even just a meeting can be transformed into a fun and creative get-together. The artworks relate to all of life’s themes: A painting, a sculpture, or an installation becomes an entry point for a communal journey of discovery that will stay with the participants long after the event is over. Please get in touch for more information and to plan an event tailored to your requirements. Art to touch and take home! Visit the Kunsthalle Mannheim museum shop. Our museum restaurant is a meeting point for flaneurs and foodies in the heart of the city.